The journey of faith from Red Sea to Promised Land is mirrored by the journey of Lent. There are many obstacles on the way, but lack of water is not the most serious one. The people’s complaint against Moses arises out of their resentment of his leadership. “Why did you bring us out of Egypt to kill us … with thirst?” Underlying that is their loss of trust in God: “Is the Lord among us or not?” When our relationships are not anchored in our relationship to the Source of our being, they are prone to rivalry and resentment; this can lead to social instability and chaos. That is what Moses fears, sensing that he could become the victim of his people. In the Epistle reading, Paul describes the justification he learned in his encounter with the crucified and risen Christ. Prior to this encounter, Paul lived by self-justification– i.e. depending on his own righteousness while blaming others for his troubles (as the Israelites in the wilderness did). Paul now realizes this was a delusion, the kind of self-justification that had crucified Christ, and that real righteousness is simply Christ’s righteousness, through the grace of the Spirit dwelling in him. In fact, Jesus became the victim of his people, in order to reveal this different kind of righteousness. “While we were still sinners Christ died for us.” That’s God’s kind of righteousness — loving forgiveness which invites us into a new relationship of repentance and faith. The encounter at Jacob’s well illustrates self-justification. The Romans had victimized the Jews, who had victimized the Samaritans, who had victimized this woman. 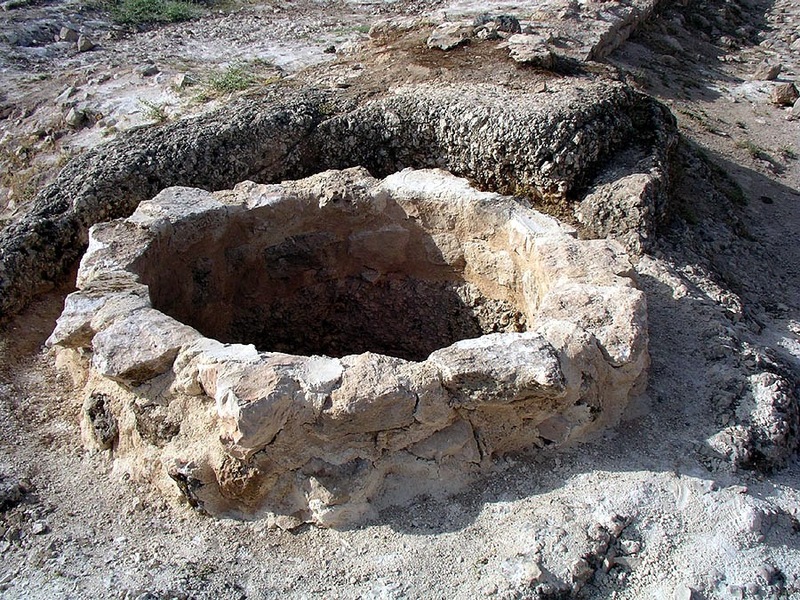 In her culture a woman needed a man for survival, and only men could sue for divorce, yet she was considered the guilty one — thus her noon-day trip to the well, alone. She had allowed herself to be defined by how her community saw her. Yet, confronted by a Jew, she stands with her people, protesting his effrontery in asking her, a Samaritan, for a drink. When he offers her living water, she sarcastically demands a drink from him so that she need never trudge out to the well again! The banter between them is revealing; Jesus is offering ‘water’ that ends thirst forever; by contrast, thirst that does not find the fountain of God’s love can never be truly satisfied by any other kind, as she knows well. Jesus reveals that he knows her secret. She does not retreat in shame, for he — a Jewish man, no less — treats her with respect, implying that he knows the secrets of her community as well. She begins to see herself through his eyes, is liberated from her self-justifying posture and broaches a topic that she would otherwise have considered closed. Whose temple is the true one? His answer is truly liberating. She goes to her people, “Come and see a man who told me everything I have ever done. He cannot be the Messiah, can he?” This may have been a disturbing message for her people, because this stranger must know their secrets too. But Jesus’ gracious respect has begun to undo the chain of victimization and resentment, and they too open their hearts to him. The nameless woman has moved from non-believer to apostle: “Come and see” she says, the precise words which Jesus first spoke to his disciples (1:39). Jesus will be for us all the source of living water, flowing from his pierced side (19: 32 - 37). God promised water for the wandering Israelites if Moses would strike the rock at Horeb, on which God would be standing. Is this a foreshadowing of God offering his son to be struck, in order to provide living water for his people? John W. B. Hill is an Anglican presbyter in Toronto, Canada, author of one of the first Anglican sources for catechumenal practice, Council member of APLM, and chair of Liturgy Canada. Angela Emerson was a litigation lawyer in Toronto for 31 years; she left the practice in June, 2013 to have a saner lifestyle and pursue other interests. Angela obtained her M.Div. from Wycliffe College at the University of Toronto in 2009. 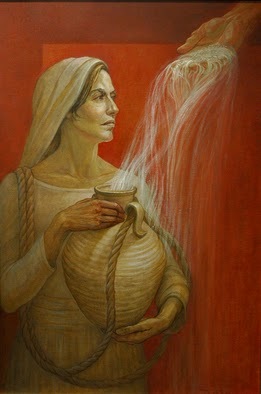 “Living Water, The Woman at The Well” (2008), by Judith Fritchman.